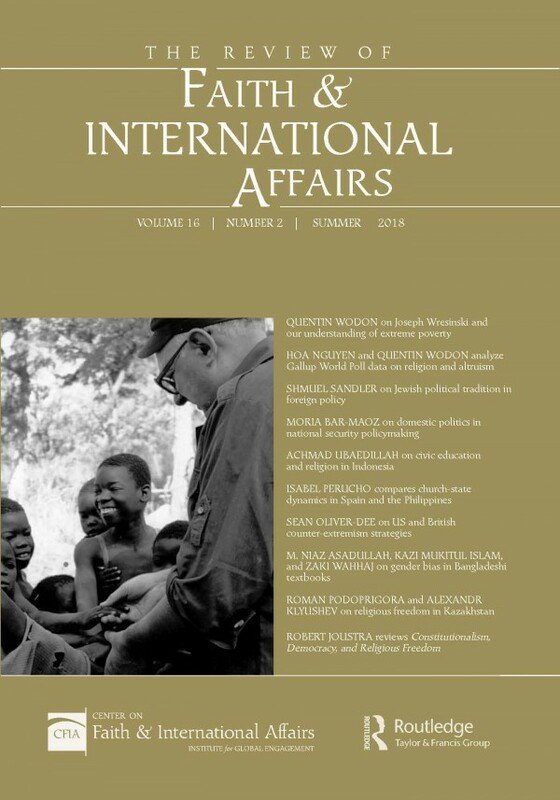 The summer 2018 issue of The Review of Faith & International Affairs features cutting-edge research and original data analyses at the forefront of the religion and international affairs field. The lead article by Quentin Wodon explains how faith shaped the anti-poverty activism of Joseph Wresinski, founder of the International Movement ATD Fourth World. The issue also features innovative articles on topics including: Gallup World Poll data on religion and altruism; Jewish political tradition in foreign policy; domestic religious politics in national security policymaking; civic education and religion in Indonesia; church-state dynamics in Spain and the Philippines; US and British counter-extremism strategies; gender bias in Bangladeshi textbooks; and religious freedom in Kazakhstan.